Professor Layton is a character from the puzzle game series of the same name. 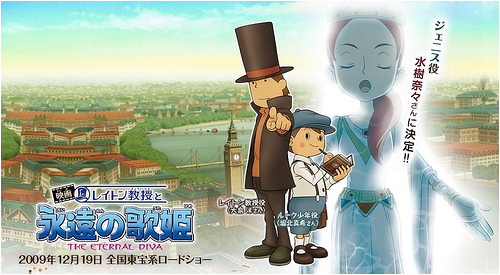 Click HERE to read the previous JAPAN Style’s article about Professor Layton series. Figure skating!! Isn’t it kind of strange?? Look at his brilliant figure skate performance! For the promotion of the film “Professor Layton and the Eternal Diva”, he performed at akasaka Sacas in Akasaka, Tokyo. The music is the movie theme song “The Eternal Diva” by Nana Mizuki.